Simon & Tavish having fun working at the West Van Christmas tree lot to raise money for our group. It’s the start of a new year and there are many fun adventures waiting for us. Let’s remember to play safe and have fun out there! 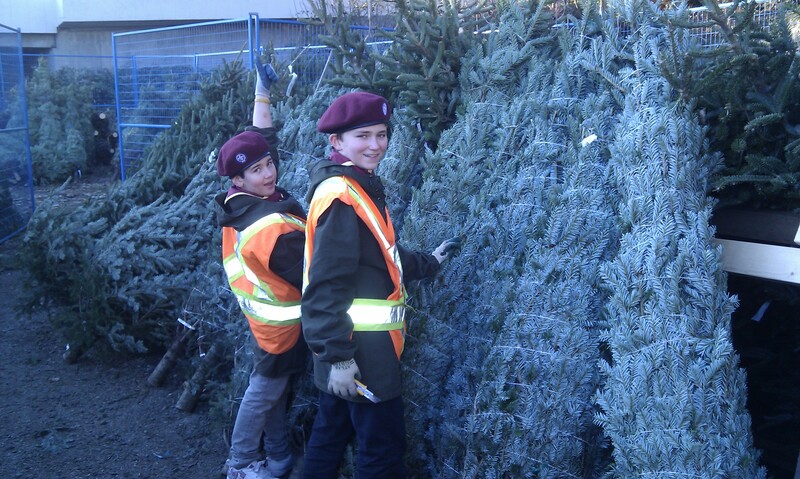 Thanks to all our Scouts and their parents for helping out at the West Van Scouts’ Christmas tree lot during December. I hope Santa brought everyone some excellent outdoor gear for Christmas or Hanukkah! There’s a full moon tonight and the weather forecast is for clear skies. This is the perfect night for our monthly night hike on Cypress! I think I will try out the new trekking poles Santa brought me for Christmas. You might notice that I’ve changed some of the formatting of our website. I’ve made the front page a “static page” (it was originally formatted to be the blog page of the site) and I’ve also created a drop down menu for “Our Adventures” to be the new home of all of the photos and stories from our ongoing activities (i.e., I’ve formatted it to be the blog page on the site now). By clicking on “Our Adventure Blog!” you are presented with the blog format that you are reading now of our activities from today onward. To access last year’s posts, simply click on the first item in the drop down menu: “Archive: 2011 (Sept.-Dec.)”. Similarly, to access the previous years’ posts, click the second item in the drop down menu: “Archive: 2010-11“. As always, this is an ongoing experiment to learn how to create and run a web site and blog for our group. There’s going to be a few stumbles along the way but hopefully the end result will be a good resource for the Scouting community. UPDATE: April 23, 2012 – I’ve now moved all of the original 2011-2012 posts over to the new Blog format so the old “Archive: 2011” item on the drop-down menu has been removed. Accordingly, please disregard the line starting with “To access last year’s posts…” above.